There is a new sculpture outdoors at the Toledo Museum of Art. Perhaps you caught the installation? Well, it’s lit up at night now and a lovely site to see! 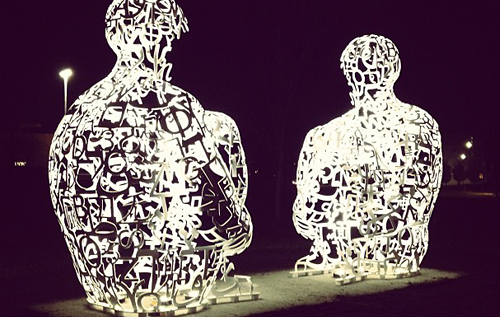 Two large seated figures face each other… created of white-painted steel letterforms. The work, titled Spiegel (German for “mirror”), is by Barcelona-born artist Jaume Plensa. His work has been installed internationally–a notable piece is The Crown Fountain, in Chicago’s Millennium Park. Be sure to check it out, preferably at night.